Citation Information: J Clin Invest. 2002;109(5):603-611. https://doi.org/10.1172/JCI13055. The role of the renin-angiotensin system (RAS) in angiogenesis is little known. Here, we show that the angiotensin II (ATII) type 1 (AT1) receptor plays an important role in ischemia-induced angiogenesis. 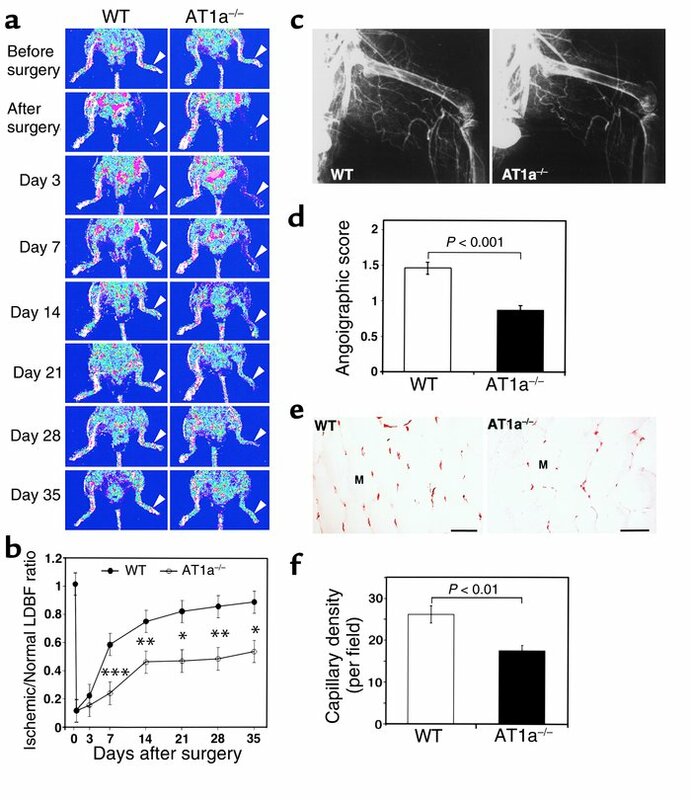 Well-developed collateral vessels and angiogenesis were observed in wild-type (WT) mice in response to hindlimb ischemia, whereas these responses were reduced in ATII type 1a receptor knockout (AT1a–/–) mice. Ischemia-induced angiogenesis was also impaired in WT mice treated with the AT1 receptor blocker TCV-116. These effects were not due to reduced systemic blood pressure (SBP), because hydralazine treatment preserved angiogenesis in WT mice although it reduced SBP to a level similar to that of AT1a–/– mice. Infiltration of inflammatory mononuclear cells (MNCs), including macrophages and T lymphocytes, was suppressed in the ischemic tissues of AT1a–/– mice compared with WT mice. Double immunofluorescence staining revealed that infiltrated macrophages and T lymphocytes expressed VEGF, and the expression of VEGF and monocyte chemoattractant protein-1 was also decreased in AT1a–/–. Finally, the impaired angiogenesis in AT1a–/– mice was rescued by intramuscular transplantation of MNCs obtained from WT mice, further indicating the importance of MNC infiltration in ischemia-induced angiogenesis. Thus, the ATII–AT1 receptor pathway promotes early angiogenesis by supporting inflammatory cell infiltration and angiogenic cytokine expression. Angiogenesis was impaired in the ischemic hindlimb of AT1a–/– mice. (a) A low perfusion signal (dark blue) was observed in the ischemic hindlimb of an AT1a–/– mouse, whereas a high perfusion pattern (red to orange) was detected in a control WT mouse. (b) Computer-assisted quantitative analyses of hindlimb blood perfusion demonstrated a significant reduction in the ischemic/normal hindlimb blood flow ratio in AT1a–/– mice (n = 11) compared with WT animals (n = 13). *P < 0.05, **P < 0.01, ***P < 0.001, WT vs. AT1a–/–. (c) Postmortem angiograms showed markedly reduced collateral vessel formation in AT1a–/– mouse compared with WT mouse. (d) Quantitative analysis revealed a low angiographic score in AT1a–/– mice examined on postoperative day 14 (n = 5 in each group). (e) Immunostaining of ischemic tissues with anti-CD31 mAb (brown) showed markedly reduced capillary density in an AT1a–/– mouse compared with a WT mouse. (f) Quantitative analysis revealed a reduced capillary density in AT1a–/– mice examined on postoperative day 14 (n = 5 in each group).